I couldn't believe it when Greg Knott told me, "there's a meeting at Naval Lodge No. 4 tomorrow." We were in Washington D.C. for Masonic Week--an annual meeting put on by the Allied Masonic Degrees. It was my third trip to D.C. with Greg in two years, and he knew how much I wanted to see that Lodge. Greg's actually a member of Naval Lodge No. 4, but both times we'd visited before, there wasn't a meeting or somebody available to open the building. So I was thrilled to learn that LaFayette-Dupont Lodge No. 19 F. & A. M. was having their meeting the next night. No question about it--we were going! Naval Lodge has a history going back to 1805, but in 1895 they opened their new building--and it is indeed a remarkable building. The Lodge is on the 4th floor, and to get there, you can take the winding staircase--the iron support for that staircase is a single piece of cast iron. Or you could take the tiny hand-operated elevator, which is believed to be the oldest operating elevator in Washington D.C. The Lodge Room is magnificent! I've visited many Masonic Lodges over the years, and Naval Lodge is certainly one of the most remarkably furnished lodges I've visited. 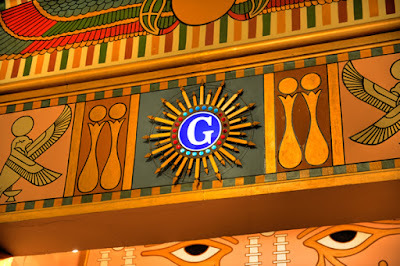 It's no wonder it has been featured in a number of television productions about Freemasonry, and was a location featured by fiction writer Dan Brown in his novel "The Lost Symbol." 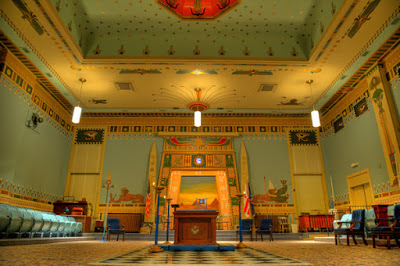 When people who are unfamiliar with Freemasonry try to imagine what the inside of a Masonic Lodge might look like, they are probably envisioning something that resembles Naval Lodge very closely--I know that before I became a Mason I certainly did. The room is massive in size, the ceiling of which towers two stories above. There is recessed section in the center of that ceiling that vaults to even loftier heights and features the starry decked heaven. There is an organ loft over the Senior Warden's station in the West that features a pipe organ. The small altar (small by comparison to the enormous space it sits in) rests on a black and white tile floor, and was hand crafted from a piece of marble by an Operative Mason that worked on the stonework of many of the buildings in the Washington D.C. area. 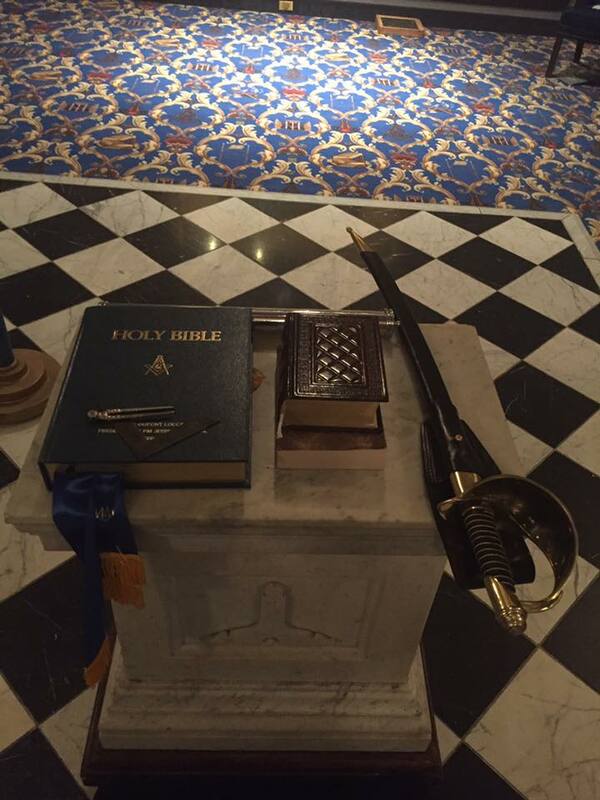 Being from the Midwest, I'm used to seeing a Holy Bible on the altar, but Naval Lodge No. 4, due to its location, has always been a more international brotherhood. The Holy Bible was one of three volumes of the Sacred Law presented on the altar, which represented the diversity of religious beliefs by the members of that Lodge. Every inch of the interior walls are decoratively painted in an Egyptian theme. 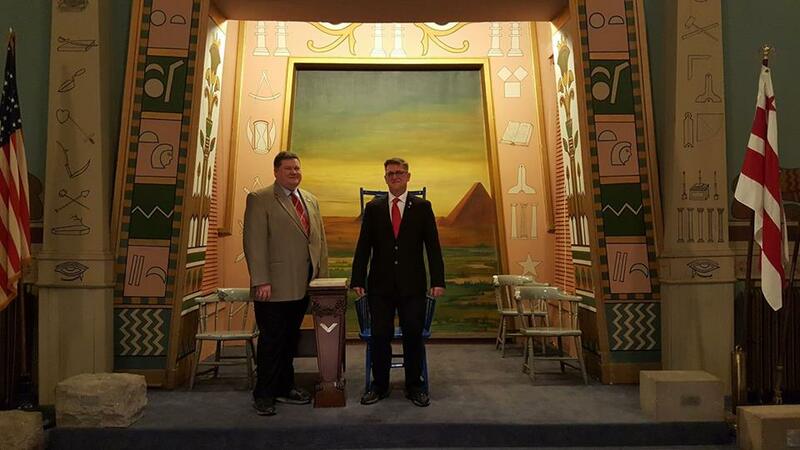 Two obelisks stand on either side of the Worshipful Master in the East. The chairs in use by the dais officers date back to the original Lodge building--1805. Amazing enough, those chairs are in remarkable shape and are still rock solid--not a creak. 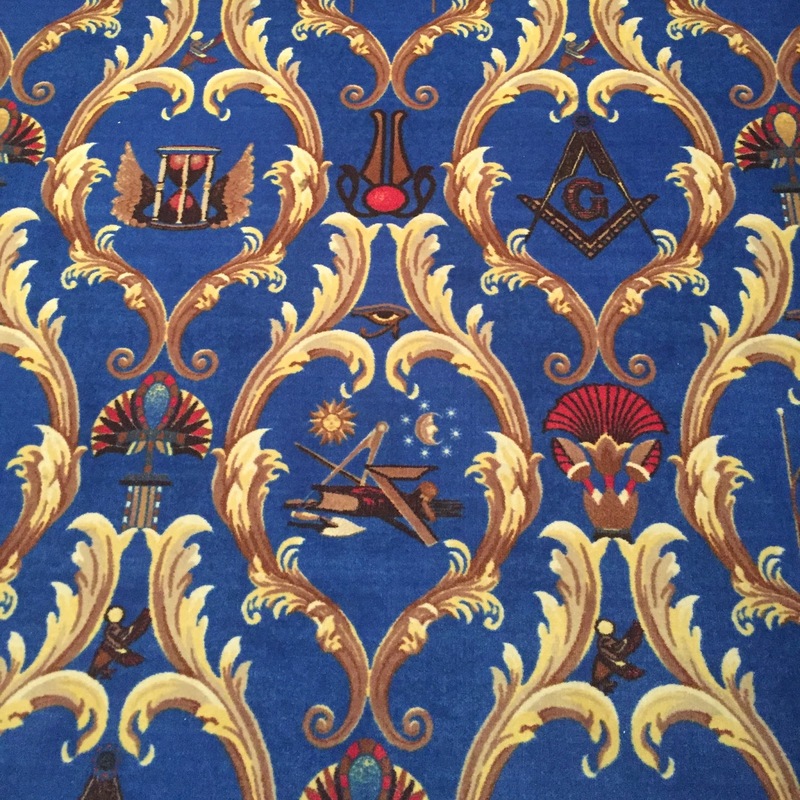 Even the carpet features deeply Masonic symbology. It's very difficult to take it all in. Greg and I just walked in not knowing exactly what to expect. It was the regular meeting night of Lafayette-Dupont Lodge No. 19, which also meets in the historic building. They welcomed us into their dining room to share in their meal, and after the meal was complete, we had to prove we were Masons. 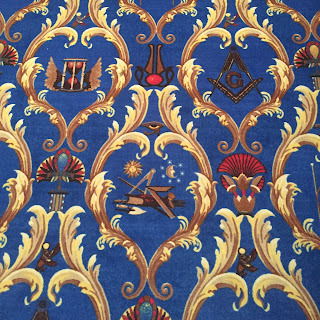 We were taken one at a time into the preparation room and through of a series of inquiries only a Mason would know the answers to, and after presenting a current dues card, were we admitted into the meeting. Every state is a little different in how they do their ritual, and it was interesting to note some of those differences, but other than that, it was the same business meeting I've attended many times before. Reading the minutes, treasurer's report, discussing upcoming events, reading a petition, etc. 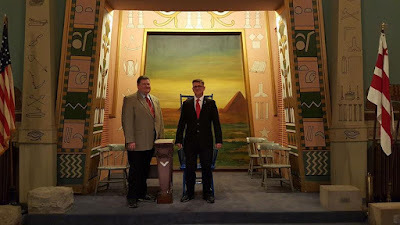 When we were asked to stand up and say something to the Brethren of the Lodge, Greg mentioned we were both contributors to The Midnight Freemasons blog . . . to our surprise, the Lodge Secretary said, "I know that blog well!" Sometimes we forget just how far and wide our work here on The Midnight Freemasons travels. By the time the meeting was finished, we all departed as good friends. We shook hands, we took photos, and we exchanged contact information--I've already heard from a few of our new friends. I'd like to thank the Brethren of LaFayette-Dupont Lodge No. 19 for making us feel so welcome, and sharing their evening with us. One of the wonderful things about our Fraternity is that no matter where we may travel, it's never difficult to find a Brother.